Are Germany really that good at penalties? How important is home advantage? And which Mexican defender has the same World Cup scoring record as Cristiano Ronaldo? 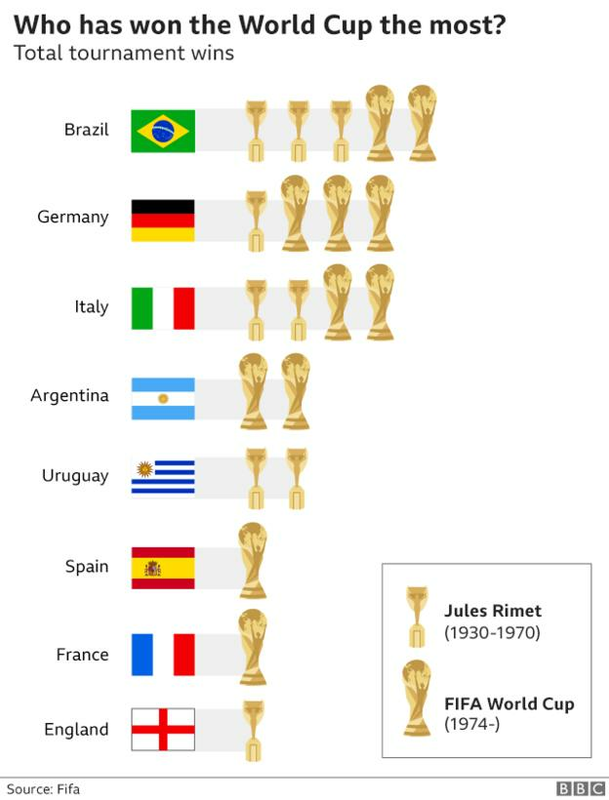 1. Who has won the World Cup? Brazil are top of the table, with five tournament wins. Their last was in 2002. They hosted in 2014, but their home tournament came to a crashing end with a 7-1 semi-final humiliation by Germany. No country outside Europe or South America has won the tournament, and victories for Germany, Spain and Italy in the past three finals mean Europe leads with 11 victories to South America's nine. 2. Who has scored the most goals? 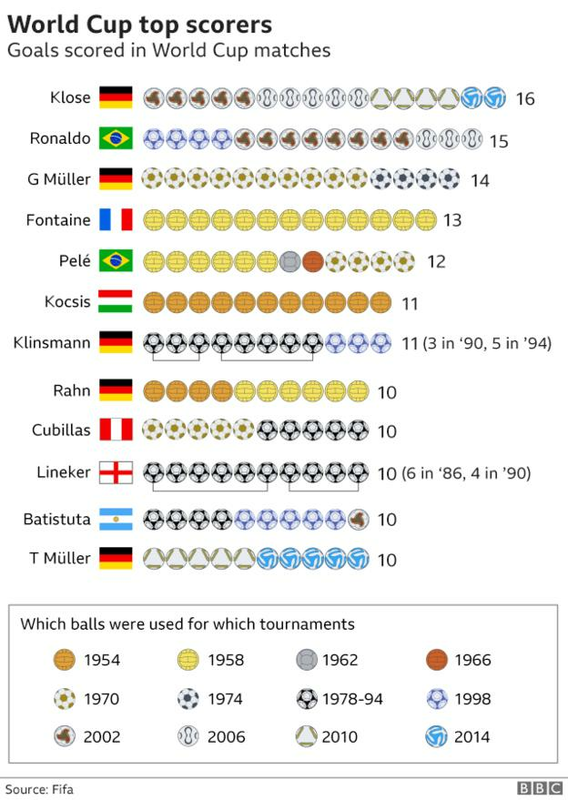 German goal machine Miroslav Klose tops the chart with 16 across four World Cups. He retired in 2016, but will be going to Russia as a member of his country's backroom staff. Brazilian Ronaldo is second with 15 goals, eight of which came in their 2002 triumph. France's Just Fontaine holds the record for the most goals in a single tournament. He scored 13 in six games in the 1958 tournament. 3. What about current players? Of the players to have scored 10 or more World Cup goals, only Germany's Thomas Muller will be heading to Russia as a player. 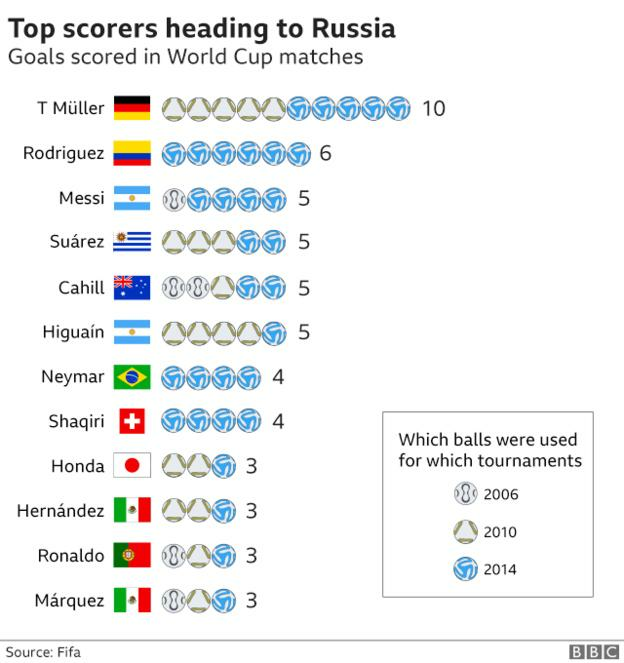 To join his compatriot Klose at the top of the list, Muller would have to beat his previous record of five goals in a single tournament. Colombia forward James Rodriguez won the Golden Boot last time out, so a repeat performance this time will put him among the best. Rafael Marquez, the only defender on the list, is going into his fifth World Cup for Mexico with the same scoring record as Cristiano Ronaldo. The last World Cup was a record low in terms of shots per game since at least 1966 - the first year football experts Opta hold data for. Despite this, the average of 2.7 goals in each 2014 game was the highest since Spain 1982. There appears to have been a decline in the number of shots from long range. 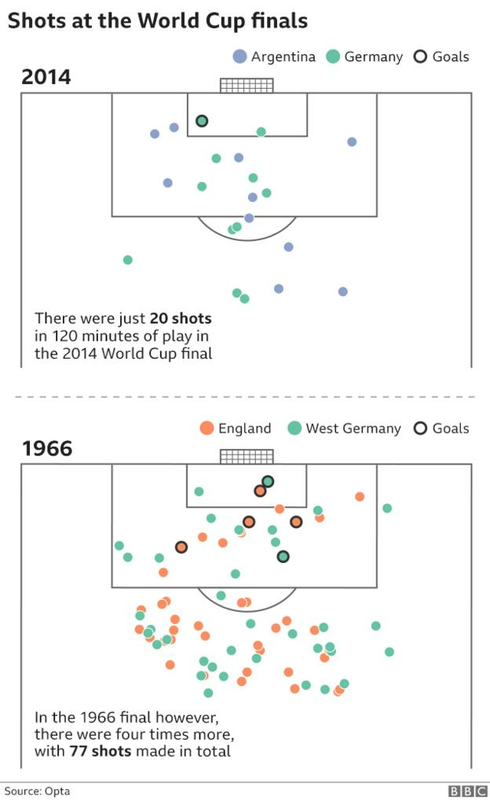 A good example is comparing the last World Cup final with the first one for which Opta has shots data - England's triumph in 1966. In the 1966 final there were twice as many shots from outside the box than inside, but of the 20 shots in the 2014 final, more were taken from inside the penalty area. Since that win in 1966, England have only got past the quarter-finals once - in 1990. But that hasn't stopped other countries filling their squads with players from the English leagues. Even with players such as Leroy Sane, Marcos Alonso and David Luiz left at home, the Premier League still supplied more players than any other. 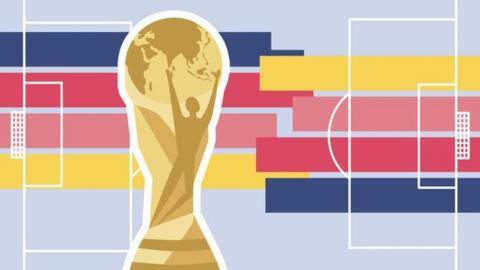 There were 130 World Cup players registered to clubs from England's top three leagues when the squads were announced, compared with 81 from Spain and 67 from German sides. Uruguay, Panama, Saudi Arabia and Russia are the only countries that have not called up any players based in England. England is also the one country where all 23 players in the squad are from teams in the same league. Sweden and Senegal are at the other end of the spectrum - they're the only two countries without any players from their local league. 6. How does the host team do? No-one in Brazil will need reminding of the two times they've hosted the World Cup. Losing the title to Uruguay in 1950 and going out 7-1 to Germany in 2014 were national embarrassments. But most other countries perform better when they're boosted by home support. 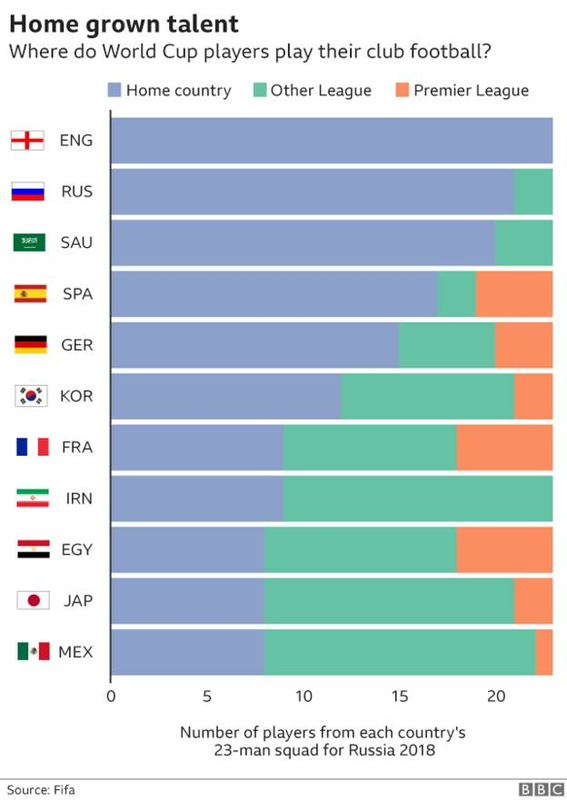 Russia will hope they can follow the trend and get out of their group alongside one of Uruguay, Egypt and Saudi Arabia. If they do, South Africa will remain as the only host nation to have been eliminated in the first round. No World Cup report would be complete without it ending on penalties. Only one German has ever missed from the spot at a World Cup, and they've won all four shootouts they've been in. Since then they've scored 15 in a row in a record dating back to 1982. And in a surprise to no-one, England are the worst team in World Cup penalty shootout history, having lost three without winning any... yet. Italy have also been eliminated in the most cruel way three times, including the 1994 final when star player Roberto Baggio famously blasted the ball over the bar. But their 2006 final win against France probably went some way to repairing Italian feelings about the format. 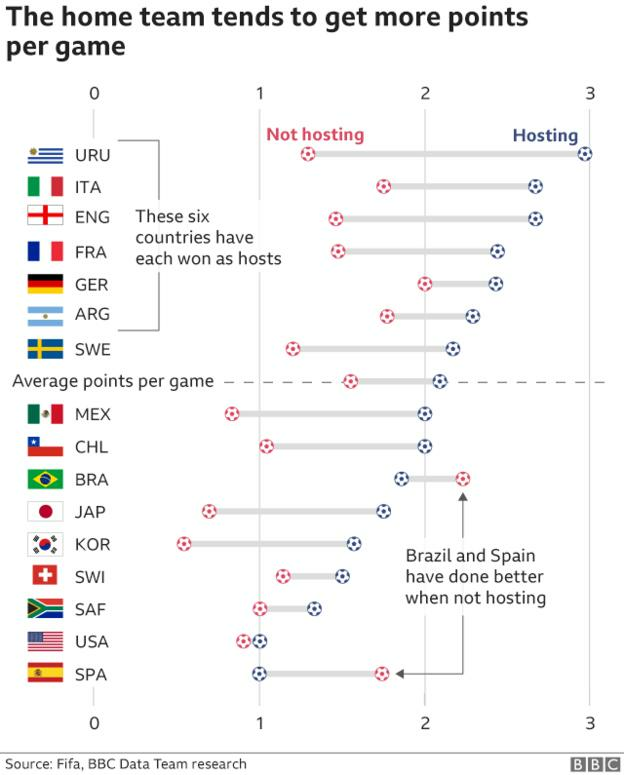 For the 'Home team tends to get more points' graphic, the data we've taken from Fifa counts the result as a draw if a knockout tie was resolved on penalties and as a win or loss if the result happened in extra time. We've awarded three points for a win and one for a draw in knockout games as well as group-stage ones. 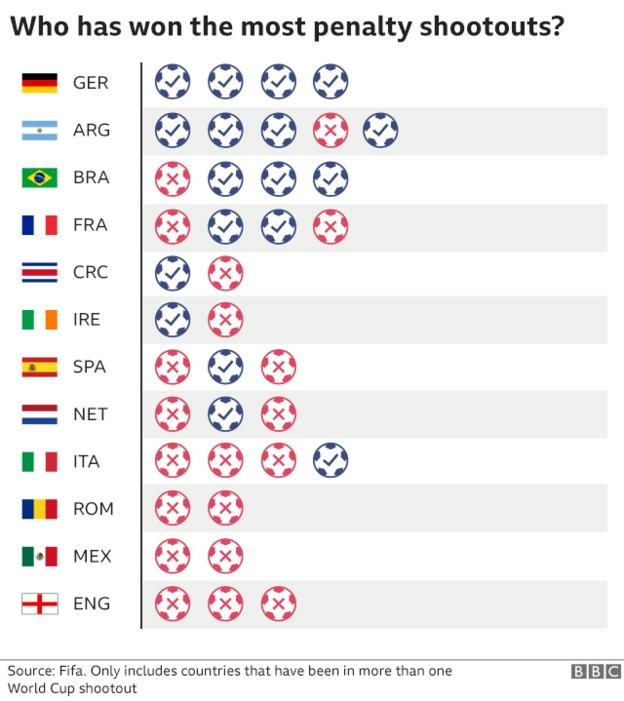 The 'average' is just from those countries that have hosted tournaments, rather than an average across all World Cup competitors in history. For the 'homegrown talent' graphic we included the 11 countries that had the highest number of players playing in their home countries. The clubs that players are associated to is taken from the official list produced by Fifa on 4 June. Last edited by Blackleaf; Jun 10th, 2018 at 06:17 AM..